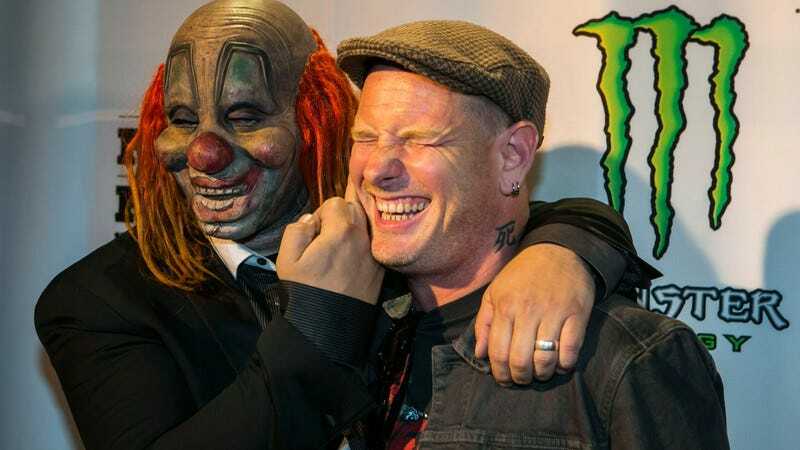 Answering an anguished nation’s cry of, “But what does the guy from Slipknot think about Kanye West?,” last week Corey Taylor released a scathing video stating that Kanye West is not the world’s greatest living rock star. The new acting president of rock ‘n’ roll (Dave Grohl is currently nursing his broken leg) had spoken. Still, there were more than a few detractors, and the Slipknot frontman loved every minute of it. Now Taylor, who presumably made the video so that reporters would have something to ask him about while he’s out promoting his book, You’re Making Me Hate You, tells Billboard—with presumed false amazement—“It’s so funny, man; it was like one little comment and now everybody’s talking about it and it’s just getting funnier and funnier.” Of course, plenty of people make little comments every day, just not all of them are said in videos shot on a soundstage featuring a guy about to go out on a promotional tour taking digs at one of media’s favorite loudmouths. Or maybe it’s not about the book at all. Perhaps this public feud is all leading up to the return of rap-rock—’90s nostalgia is big right now—as Kanye and Slipknot join forces for a new tune. It can be assumed that Taylor Swift will be brought in to sing the hook.